Herman Hasz was born in 1834. He was the son of Peter Hasz and Rebecca Karstens. Herman Hasz died before 1904. Name Variation Johann Nicholaus Hasz was also known as Nicholas N.
Johann Nicholaus Hasz was born on 12 September 1836 at Westerende, Luedingworth, Handeln, Hanover, Germany. Johann Nicholaus Hasz married Marie Margaratha Dorathes Luhrsen, daughter of Henry Luhrsen and Annie Liendhoff, circa 1861 at Loganville, Sauk, Wisconsin. Johann Nicholaus Hasz died on 25 August 1912 at Loganville, Wisconsin, at age 75. [S245] U.S. Federal Census 1900 U.S. Federal Census, by Ancestry.com, Dwelling 118. ED 149. [S244] U.S. Federal Census 1910 U.S. Federal Census, by Ancestry.com, Dwelling 200. ED 130. Name Variation Marie Margaratha Dorathes Luhrsen was also known as Maria. Name Variation Marie Margaratha Dorathes Luhrsen was also known as Mary. Name Variation Marie Margaratha Dorathes Luhrsen was also known as Luehrsen. Married Name circa 1861 As of circa 1861,her married name was Hasz. Marie Margaratha Dorathes Luhrsen was born on 31 July 1841 at Franzburg, Hanover, Germany. She was the daughter of Henry Luhrsen and Annie Liendhoff. Marie Margaratha Dorathes Luhrsen married Johann Nicholaus Hasz, son of Peter Hasz and Rebecca Karstens, circa 1861 at Loganville, Sauk, Wisconsin. Marie Margaratha Dorathes Luhrsen died on 15 May 1934 at Grafton, Clark, Wisconsin, at age 92 also reported as 5 May 1934. [S248] U.S. Federal Census 1860 U.S. Federal Census, by Ancestry.com, Page 47. Dwelling 360. [S243] U.S. Federal Census 1920 U.S. Federal Census, by Ancestry.com, ED171. Dwelling 195. [S250] U.S. Federal Census 1930 U.S. Federal Census, by Ancestry.com, ED25. Dwelling 6. Nickname Peter William Hasz also went by the name of William. Peter William Hasz married Polly (?). Peter William Hasz was born in 1840 at Hannover, Germany. Peter William Hasz died before 1904. [S247] U.S. Federal Census 1870 U.S. Federal Census, by Ancestry.com, Stamp 287. Page 8. Dwelling 63. Polly (?) married Peter William Hasz, son of Peter Hasz and Rebecca Karstens. Polly (?) was born circa 1844 at Pennsylvania. Name Variation Christian Jacob Hasz was also known as Hass. Name Variation Christian Jacob Hasz was also known as Christ. Christian Jacob Hasz was born on 18 July 1842 at Hanover, Germany. Christian Jacob Hasz married Katharina Dorothea Elizabeth Westedt, daughter of Henry Westedt and Mary Schultz, on 2 February 1869. Christian Jacob Hasz died on 22 October 1897 at age 55 also reported as 02 Oct 1897. 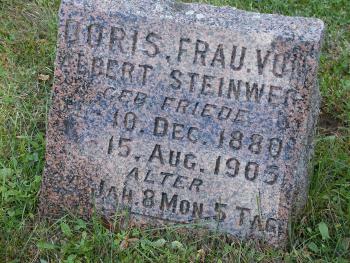 He was buried after 22 October 1897 at Saint Peters Lutheran Church Cemetery, Loganville, Sauk, Wisconsin. Name Variation Katharina Dorothea Elizabeth Westedt was also known as Dora. Name Variation Katharina Dorothea Elizabeth Westedt was also known as Dorothea. Name Variation Katharina Dorothea Elizabeth Westedt was also known as Westadt. Married Name 2 February 1869 As of 2 February 1869,her married name was Hasz. Married Name 2 February 1869 As of 2 February 1869,her married name was Hass. Katharina Dorothea Elizabeth Westedt was born on 22 November 1849 at Masendorf, Hanover, Germany. She was the daughter of Henry Westedt and Mary Schultz. Katharina Dorothea Elizabeth Westedt married Christian Jacob Hasz, son of Peter Hasz and Rebecca Karstens, on 2 February 1869. Katharina Dorothea Elizabeth Westedt died on 18 April 1902 at age 52 Death record of Katharina Dorothea Elisabeth (Westedt) Hass (Hasz). She was buried on 21 April 1902 at St Peter Lutheran Church, Loganville, Sauk, Wisconsin. Katharina Dorothea Elizabeth Westedt had 3 children, 2 living as of 14 Jun 1900 children. Name Variation Mary Schultz was also known as Krinia. Married Name Her married name was Westedt. Name Variation Mary Schultz was also known as Catharina Maria. Mary Schultz married Henry Westedt. Mary Schultz was born in 1822. Name Variation Wilhelmina Katharine Hasz was also known as Catherina Wilhelmina Rebecca. Married Name 12 March 1862 As of 12 March 1862,her married name was Horstmann. Wilhelmina Katharine Hasz was born on 15 December 1843 at Hanover, Germany. She was the daughter of Peter Hasz and Rebecca Karstens. Wilhelmina Katharine Hasz married Frederick Wilhelm Horstmann, son of Karl Horstmann, on 12 March 1862. Wilhelmina Katharine Hasz died on 22 July 1916 at Loganville, Sauk, Wisconsin, at age 72. [S247] U.S. Federal Census 1870 U.S. Federal Census, by Ancestry.com, Stamp 293. Page 20. Dwelling 151. Name Variation Frederick Wilhelm Horstmann was also known as Horstman. Frederick Wilhelm Horstmann was born on 16 June 1827 at Hille, Hanover, Germany. He was the son of Karl Horstmann. Frederick Wilhelm Horstmann married Wilhelmina Katharine Hasz, daughter of Peter Hasz and Rebecca Karstens, on 12 March 1862. Nickname Johann George Hasz also went by the name of George. Johann George Hasz was born on 15 August 1854 at Hanover, Germany. Johann George Hasz married Wilhemina Arminda Schulte, daughter of Freidrich Schulte and Fredericka (? ), on 20 March 1879. Johann George Hasz died on 8 July 1928 at age 73. [S247] U.S. Federal Census 1870 U.S. Federal Census, by Ancestry.com, Page 22. Dwelling 169. [S246] U.S. Federal Census 1880 U.S. Federal Census, by Ancestry.com, NA Film Number T9-1446. Page 287B. ED265. Dwelling 225. [S245] U.S. Federal Census 1900 U.S. Federal Census, by Ancestry.com, Sheet 8A. Dwelling 100. ED 149. [S244] U.S. Federal Census 1910 U.S. Federal Census, by Ancestry.com, Dwelling 16. ED 130. [S243] U.S. Federal Census 1920 U.S. Federal Census, by Ancestry.com, ED 171. Sheet 1B. Dwelling 27. Married Name 20 March 1879 As of 20 March 1879,her married name was Hasz. Wilhemina Arminda Schulte was born on 29 May 1858 at Wisconsin. She was the daughter of Freidrich Schulte and Fredericka (?). Wilhemina Arminda Schulte married Johann George Hasz, son of Peter Hasz and Rebecca Karstens, on 20 March 1879. Wilhemina Arminda Schulte died on 28 July 1948 at Loganville, Sauk, Wisconsin, at age 90. [S250] U.S. Federal Census 1930 U.S. Federal Census, by Ancestry.com, ED56-22. Dwelling 42A. Freidrich Schulte married Fredericka (?). Fredericka (?) married Freidrich Schulte. Henry William Hasz was born on 11 July 1857 at Wisconsin. Henry William Hasz married Amelia Johanna Giese, daughter of August Erdman Giese and Wilhelmina Remtar, on 4 November 1883. Henry William Hasz died on 7 December 1935 at age 78. [S179] Wisconsin Sauk County Cemetery Headstones Vol. 1, pg 68. [S246] U.S. Federal Census 1880 U.S. Federal Census, by Ancestry.com, Pg 8. ED265. Dwelling 66. [S245] U.S. Federal Census 1900 U.S. Federal Census, by Ancestry.com, Dwelling 196. ED 149. [S244] U.S. Federal Census 1910 U.S. Federal Census, by Ancestry.com, Sheet 7A. Stamp 67. Dwelling 143. ED 130. [S243] U.S. Federal Census 1920 U.S. Federal Census, by Ancestry.com, ED 171. Dwelling 4. Nickname Amelia Johanna Giese also went by the name of Emilie. Married Name 4 November 1883 As of 4 November 1883,her married name was Hasz. Amelia Johanna Giese was born on 25 October 1864 at Zilkenhagen, Pommern Kraes, Naustten, Germany. 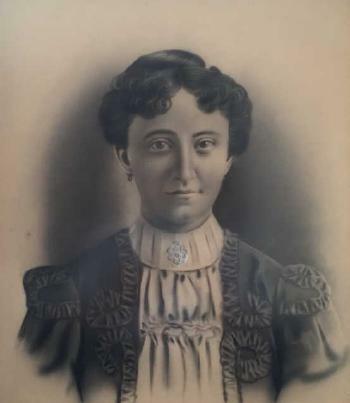 Amelia Johanna Giese married Henry William Hasz, son of Peter Hasz and Rebecca Karstens, on 4 November 1883. Amelia Johanna Giese died on 2 November 1930 at Loganville, Wisconsin, at age 66. Amelia Johanna Giese immigrated with Wilhelmina Remtar and August Erdman Giese in 1872. [S243] U.S. Federal Census 1920 U.S. Federal Census, by Ancestry.com, Dwelling 4. ED 171. Stamp 129. August Erdman Giese was born on 10 August 1836 at Germany. He was the son of (?) Giese. August Erdman Giese married Wilhelmina Remtar in 1863 at Germany. August Erdman Giese died on 7 September 1925 at Loganville, Sauk, Wisconsin, at age 89. August Erdman Giese and Wilhelmina Remtar immigrated in 1872. [S179] Wisconsin Sauk County Cemetery Headstones Vol. 1, pg 71. [S243] U.S. Federal Census 1920 U.S. Federal Census, by Ancestry.com, Sheet 3A. ED 171. Dwelling 61. Nickname Wilhelmina Remtar also went by the name of Minnie. Married Name 1863 As of 1863,her married name was Giese. Wilhelmina Remtar was born on 13 June 1838 at Borutin, Pommern, Mausettin, Germany, also reported as 1839. 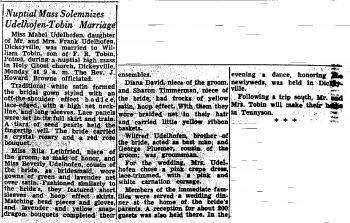 She married August Erdman Giese, son of (?) Giese, in 1863 at Germany. Wilhelmina Remtar died in 1920. Wilhelmina Remtar and August Erdman Giese immigrated in 1872. Wilhelmina Remtar had 7 with 5 living in 1900 children. She had 6 with 5 living in 1910 children. Walter Charles Timmerman was born on 30 July 1917 at Wisconsin. He was the son of Peter Jacob Timmerman and Rosanne Hauser. 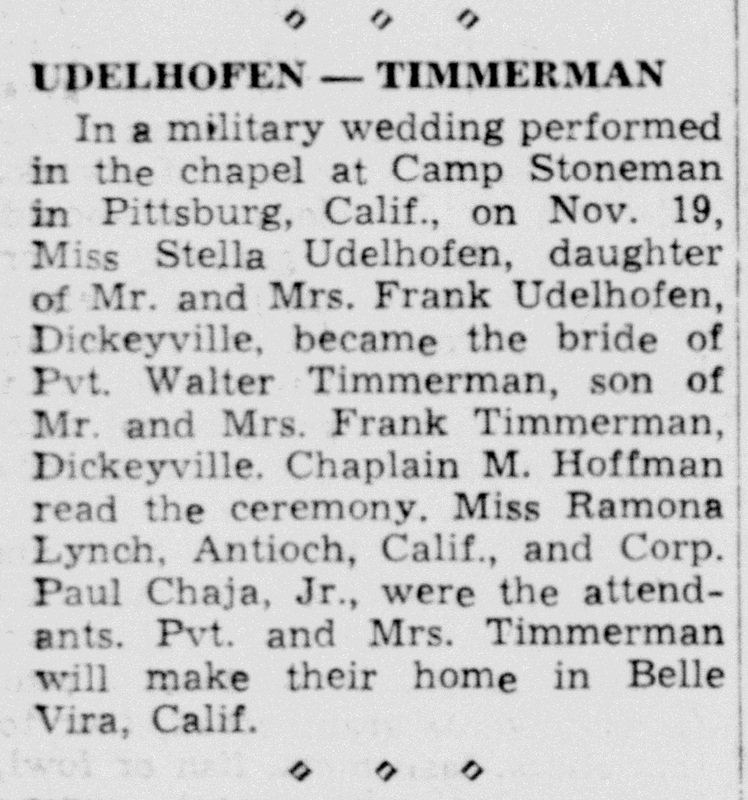 Walter Charles Timmerman married Stella Mae Udelhofen, daughter of Frank Arlow Udelhofen and Mary M. Richard, on 19 November 1942 at Camp Stoneman chapel, Pittsburg, California, Stella Udelhofen and Walter Timmerman wedding announcement. Walter Charles Timmerman died on 18 February 1982 at Southwest Health Center, Cuba City, Grant, Wisconsin, at age 64 Walter C. Timmerman, 64, of Route 1, Cuba City, Wisconsin, died at 1:53 a.m., Thursday, February 18, 1982, at Southwest Health Center in Cuba City. Visitation was from 2 to 9 p.m., Friday, February 19, at the Gene Siegert Funeral Home in Cuba City, where the Rosary was said at 8 p.m. Funeral services were at 10:30 a.m., Saturday, February 20, at Immaculate Conception Curch in Kieler, Wisconsin, and burial was in the church cemetery. Mr. Timmerman was survived by his wife, Stella; five sons, Walt Timmerman, Jr., of Bettendorf, Ia., David W. Timmerman, of rural Potosi, Wis., Ronald J. Timmerman and Mark Timmerman, both of rural Cuca City, Wis., and Randy Timmerman, of Dickeyville, Wis; four daughters, Mrs. Ed (Sharon) Harwick, of Kieler, Wis., Mrs. Don (Diane) Foss, of rural Hazel Green, Wis., Mrs. Roger (Sue) Andrews, of rural Belmont, Wis., and Lisa Timmerman, at home; 19 grandchildren; a brother, Ervin Timmerman, of Louisburg, Wis; and three sisters, Mrs. Sylvester (Viola) Vosberg and Mrs. LaVern (Marian) Droessler, both of rural Cuba City, Wis., and Sister Lillian Timmerman, OSF, of Rockford, Ill. He was buried after 18 February 1982 at Immaculate Conception Church Cemetery, Kieler, Grant, Wisconsin. Name Variation William Alfred Tobin was also known as Bill. William Alfred Tobin was born on 28 August 1926 at Wisconsin. 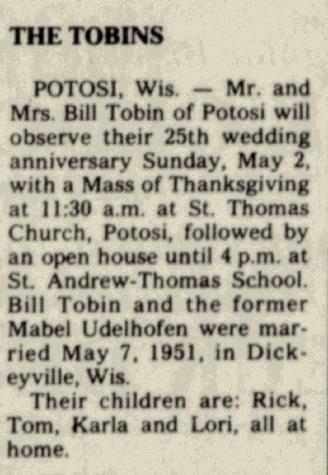 William Alfred Tobin married Mabel Gertrude Udelhofen, daughter of Frank Arlow Udelhofen and Mary M. Richard, on 7 May 1951 at Dickeyville, Grant, Wisconsin, Mabel Udelhofen and William Tobin wedding announcement; also reported as May 14, 1951. William Alfred Tobin died on 23 April 2016 at age 89 William A. "Bill" Tobin, devoted husband to Mabel for 63 years until her passing in February 2015, father and grandfather, age 89, of Tennyson, passed away on Saturday, April 23, 2016, surrounded by his loving family. 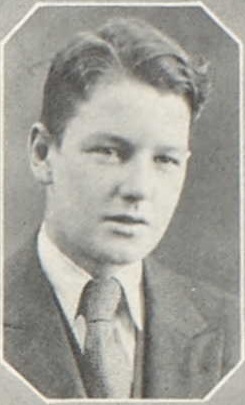 He was born on August 28, 1926, the son of F. Rickert and Bertha (Pluemer) Tobin. Bill enlisted in the United States Army in 1944, serving in the Philippines until his honorable discharge in 1946. 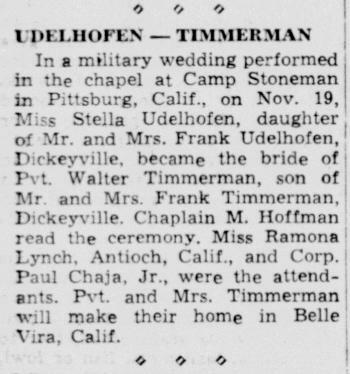 On May 7, 1951, he married Mabel Udelhofen at Holy Ghost Catholic Church in Dickeyville. Together they raised four children. Bill was employed at John Deere Dubuque Tractor Works for 34 years, retiring in 1984. He was also a charter member of the VFW Post No. 5276 of Potosi, a Village of Tennyson board member from 1972 until 1998, and a member and officer of the Catholic Knights Branch 42 for over 50 years. Bill was a "die hard" Chicago Cubs and Chicago Bears fan his entire life (now the Cubs will have a little help to get to the World Series). He loved the outdoors, especially fishing and hunting on the Tobin farm that has been in the family since it was homesteaded in 1841. Bill's greatest joys were spending time with his family and his grandchildren, watching their sporting events, "tinkering" in the garage (there was nothing he couldn't fix or rivet together), having morning coffee with his Roadhouse buddies and Friday afternoons at Haverlands. Those living to pay tribute and remember his wonderful ways are his four children: Rick (Kelly Bartell) Tobin, Tom (Pat) Tobin, Karla Tobin Leiser, Lori (Henry) Langkamp, all of Potosi; his grandchildren: Craig and Alison Tobin, Carl Leiser, Mitchell, Jacob, Sophie Langkamp, William Rickert Tobin, all of Potosi; Krista (Brian) Langkamp Hancock, Emily Langkamp, of Dubuque, IA; his sister, Marie (Carl) Vogelsberg, Tennyson; sister and brother-in-law: Stella Timmerman, Kieler; Wilfred (Junie) Udelhofen, Cassville; many other relatives and friends. In addition to his parents, Bill was preceded in death by his wife Mabel; siblings: John (Pauline) Tobin; Marvin (Emily) Tobin; Erma (Walt) David; brothers-in-law: Ralph Udelhofen; Merlin (Ruth) Udelhofen; Milt Vogelsberg; and Walt Timmerman. A Mass of Christian Burial was held on Wednesday, April 27, 2016, at 11:00 a.m. at St. Andrew Catholic Church in Tennyson with Father Richard Leffler officiating. Burial with military honors was in St. Thomas Cemetery, Potosi. Family and friends called on Tuesday, April 26, 2016, from 4:00 p.m. until 7:00 p.m. at the church and on Wednesday from 10:00 a.m. until time of services at the church. In lieu of plants and flowers, Bill would appreciate memorials given to SS Andrew-Thomas Catholic School. Martin Funeral Home & Cremation Services in Potosi is assisting the family. Married Name 12 October 1948 As of 12 October 1948,her married name was Udelhofen. Ruth Mary Burbach was born on 23 May 1931. She was the daughter of Walter Henry Burbach and Marian Horn. Ruth Mary Burbach married Merlin F. Udelhofen, son of Frank Arlow Udelhofen and Mary M. Richard, on 12 October 1948 at Kieler, Wisconsin, Ruth Mary Burbach and Merlin Udelhofen engagement announcement. Ruth Mary Burbach died on 14 January 2009 at age 77 Ruth M. Udelhofen, 77, of Rockton, Ill., formerly of Keiler, passed away Wednesday, Jan. 14, 2009, in Woods Crossing Nursing Home, Brodhead, after a lengthy illness. Services will be at 1 p.m. Sunday, Jan. 18, at Daley-Murphy- Wisch & Associates Funeral Home and Crematorium, Beloit, with the Rev. Tina Koenig-Ray officiating. Burial will be in Wisconsin Veterans Cemetery, King. 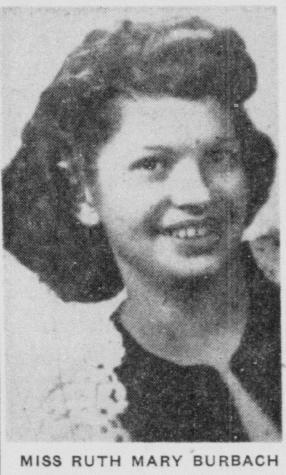 She was born on May 23, 1931, in Grant County, daughter of Walter and Marian Horn Burbach. 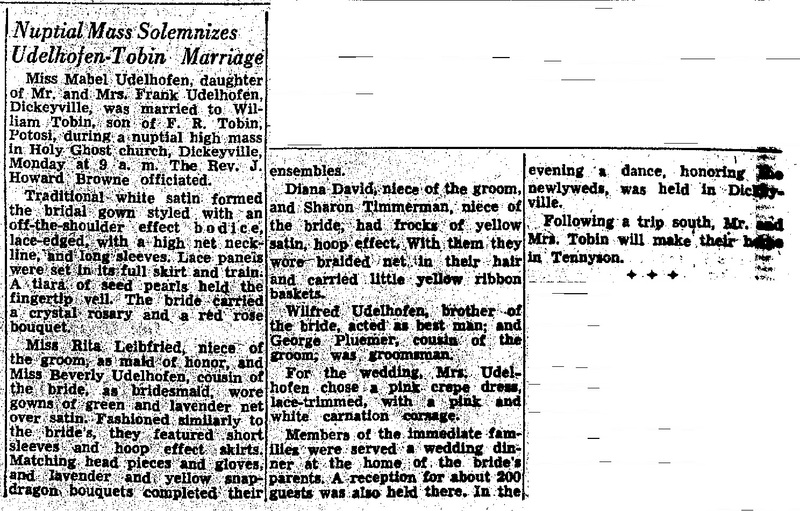 She married Merlin Udelhofen on Oct. 12, 1948, in Kieler; he preceded her in death on Nov. 16, 1991. Ruth and Merlin owned and operated the Rockton Inn, Rockton, from 1959 to 1977. She also worked for a short time at Regal Beloit. …. 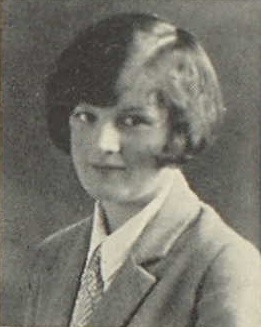 Nickname Doris Friede also went by the name of Dora. Married Name 10 December 1902 As of 10 December 1902,her married name was Steinweg. Doris Friede was born on 10 December 1880 at Germany also reported as 10 Dec 1881. [S245] U.S. Federal Census 1900 U.S. Federal Census, by Ancestry.com, ED 142. Ward 2. Sheet 11A. Dwelling 260. [S245] U.S. Federal Census 1900 U.S. Federal Census, by Ancestry.com, ED142. Dwelling 423. Name Variation Henrietti Hasz was also known as Henrietta. Name Variation Henrietti Hasz was also known as Henriette. Henrietti Hasz was born on 15 June 1877 at Wisconsin. Henrietti Hasz died on 7 October 1884 at age 7. [S179] Wisconsin Sauk County Cemetery Headstones Vol. 1, pg. 43. Name Variation Dora Schlieckau was also known as Dorothea M.
Name Variation Dora Schlieckau was also known as Anna Wilhelmina Dorothea. Married Name 4 March 1923 As of 4 March 1923,her married name was Schuette. Dora Schlieckau was born on 24 August 1901 at Wisconsin. She was the daughter of Henry Schlieckau II and Mary Catherine Hahn. 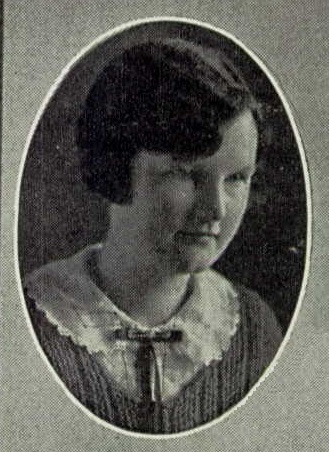 Dora Schlieckau married Arold Carl William Schuette, son of Heinrich Johann Schuette and Augusta Bergwardt, on 4 March 1923. 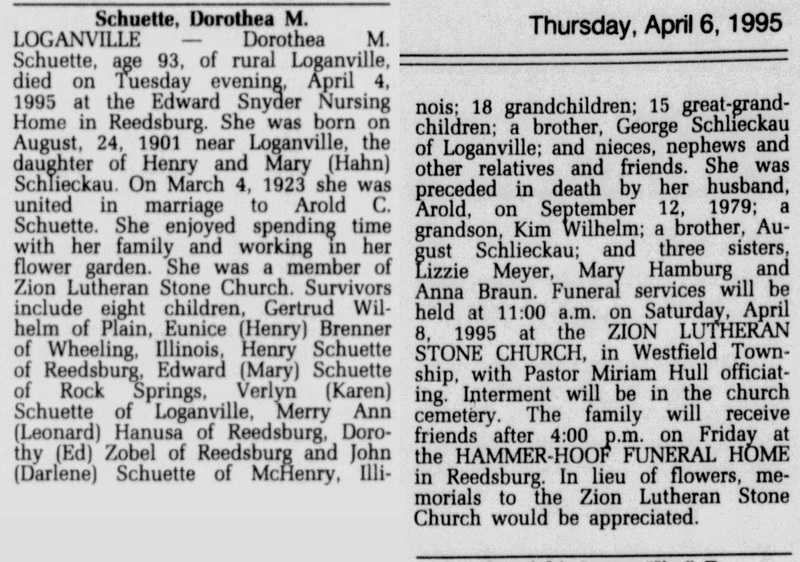 Dora Schlieckau died on 4 April 1995 at age 93 Dorothea M (Schlieckau) Schuette obituary. [S244] U.S. Federal Census 1910 U.S. Federal Census, by Ancestry.com, Sheet 6B. ED 130. Dwelling 136. [S243] U.S. Federal Census 1920 U.S. Federal Census, by Ancestry.com, ED171. Dwelling 249. Name Variation Anna Mary Joyce was also known as Joice. Name Variation Anna Mary Joyce was also known as Mary Anna. Married Name 23 October 1900 As of 23 October 1900,her married name was Daly. Anna Mary Joyce was born on 2 October 1874 at Winfield, Sauk, Wisconsin. 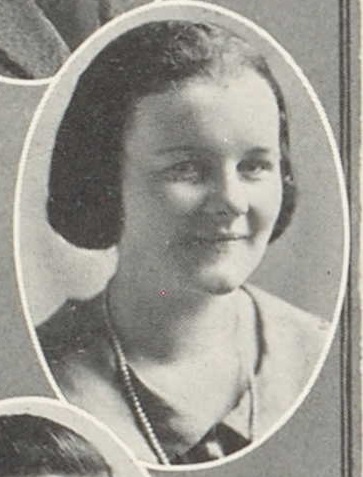 She was the daughter of Patrick E. Joyce and Mary Byrne. 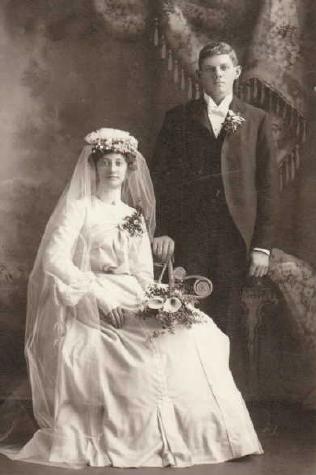 Anna Mary Joyce married Dr. Francis Peter Daly, son of Patrick Daly and Jane Moran, on 23 October 1900 at Reedsburg, Sauk, Wisconsin. [S208] Reedsburg Times Press, Reedsburg Free Press. Thursday, July 20, 1922, page 1. [S246] U.S. Federal Census 1880 U.S. Federal Census, by Ancestry.com, NA Film Number T9-1446 Page Number 291C. [S245] U.S. Federal Census 1900 U.S. Federal Census, by Ancestry.com, ED130. Sheet 15A. Dwelling 280. Name Variation Francis Matthew Daly was also known as Francis P.
Francis Matthew Daly was born on 28 May 1902 at Reedsburg, Sauk, Wisconsin. He was the son of Dr. Francis Peter Daly and Anna Mary Joyce. Francis M. Daly, 47, a former resident of this city, died suddenly on Wednesday of last week at Colorado Springs, Colo. He is survived by one brother, Patrick, Washington State; three sisters, Mrs. Lawrence Dwyer and Mrs. Earl Greiner, Milwaukee, and Mrs. Leo Murphy, La Crosse. The funeral was held at 9:15 a.m. Monday at the Gant Funeral Home, and at 9:30 a.m. at Sacred Heart Catholic church. The Rev. Eugene Kiernan officiated, and burial was in the church cemetery. Francis was the son of the late Dr. and Mrs. Francis P. Daly of this city. He moved from this city about 25 years ago. Name Variation Jane Claire Daly was also known as Mary J. Married Name October 1929 As of October 1929,her married name was Dwyer. Jane Claire Daly was born on 22 April 1904 at Reedsburg, Sauk, Wisconsin. She was the daughter of Dr. Francis Peter Daly and Anna Mary Joyce. 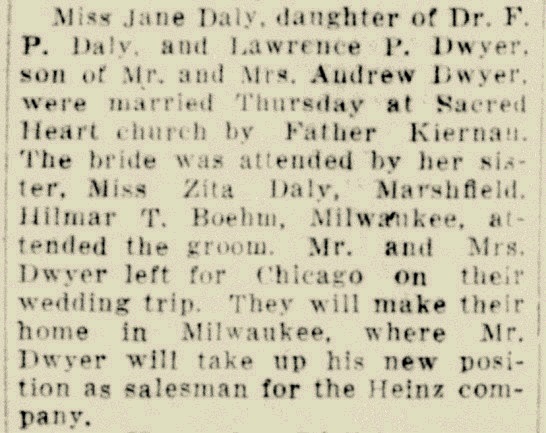 Jane Claire Daly married Lawrence P. Dwyer, son of Andrew J. Dwyer and Katherine B. Dorgan, in October 1929 at Wisconsin Jane Daly and Lawrence P Dwyer marriage announcement; her 1st marriage. Jane Claire Daly graduated in 1922 at Reedsburg High School, Reedsburg, Sauk, Wisconsin. She lived in 1959 at Cedartown, Polk, Georgia. [S208] Reedsburg Times Press, 3rd of December 1959 on page 1. Married Name Her married name was Greiner. Zita Joyce Daly was born on 27 August 1908 at Wisconsin. 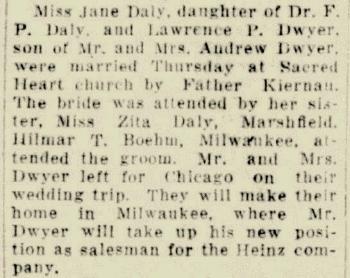 Zita Joyce Daly was the maid of honor at the wedding of Lawrence P. Dwyer and Jane Claire Daly in October 1929 at Wisconsin; Jane Daly and Lawrence P Dwyer marriage announcement; her 1st marriage. 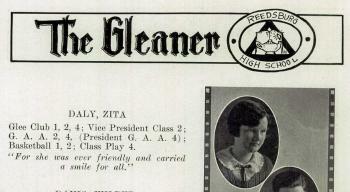 Zita Joyce Daly died in June 1973 at age 64. Zita Joyce Daly obtained US Social Security Card at Wisconsin; last residence Milwaukee, Milwaukee, Wisconsin. 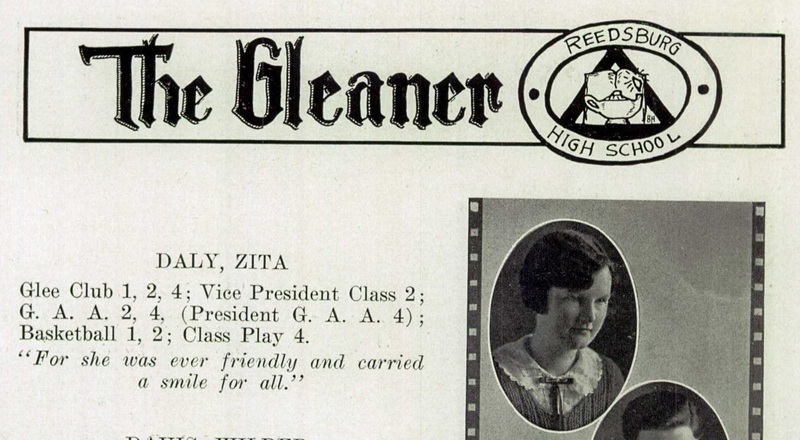 She attended school in 1925 at Reedsburg High School, Reedsburg, Sauk, Wisconsin. Mary Agnes Daly was born on 18 October 1909 at Wisconsin. Mary Agnes Daly died on 23 February 1989 at age 79. Mary Agnes Daly obtained US Social Security Card at Wisconsin; last residence La Crosse, La Crosse, Wisconsin. She graduated in 1927 at Reedsburg High School, Reedsburg, Sauk, Wisconsin. [S250] U.S. Federal Census 1930 U.S. Federal Census, by Ancestry.com, ED56-30. Dwelling 336. Patrick Joseph Daly married Helen Carr. Patrick Joseph Daly was born on 17 March 1912 at Reedsburg, Sauk, Wisconsin. He was buried after 7 August 1977 at Gate of Heaven Cemetery, Hawthorne, Westchester, New York. Patrick Joseph Daly obtained US Social Security Card at New York; last residence Scarsdale, Westchester, New York. He graduated in 1929 at Reedsburg High School, Reedsburg, Sauk, Wisconsin. [S208] Reedsburg Times Press, Reedsburg Free Press. 11 Aug 1977.